Google Settings/Services App Is Bloated, Why Is No One Discussing This? I have tried to have this conversation on /r/Android on Reddit but got downvoted but the Google Serviced settings app is a serious RAM hog now. There are now multiple services running at one time that shouldn't be. Google Analytics, Wearables, Intent for Callback, etc. It seems now that if I actually actively disable it, I get a BOOST in performance in my phone and this has been the case for months now. Any phone that has a 1GB of RAM like mines understands that there are memory issues with Android, between apps getting actively kicked out of memory constantly, multitasking is hard and every trip to the desktop is meet with several second of apps and widgets repopulating. And the biggest culprit of these memory issues? Google. I adore the fact Google Services is what keeps devices up to date and everything. But it comes at an expense in performance. I am even running ART with no animations, still can't have more than a couple browser tabs or apps open at once without reloading. Is anyone else privy to this situation or am I alone in this regard? JellyBean was barely written for 1GB of RAM. KitKat was really written for 2GB. understands that there are memory issues with Android, between apps getting actively kicked out of memory constantly, multitasking is hard and every trip to the desktop is meet with several second of apps and widgets repopulating. It's that or being told that you can't run the app because there's no free RAM. You can't have it both ways. If your phone doesn't have enough RAM for the current versions of apps (and apps grow to fit the room they have to run in, because the way they get created gets sloppier when there's more space to be sloppy in), a lot of killing and reloading is going to happen. They could have left all that in Android itself, but then every little update would have meant a version update instead of just updating Google Services. Anyone running a phone designed for a smaller operating environment than the current one has the same problem - which is one reason people replace phones every 18-24 months. zorak950 and A895 like this. It was designed to do just that. It isn't KitKat making the phone slow it is in fact the Google Settings/Services App. That isn't the solution. "Your phone is too old, so too bad". This is why some leave Android. Specs matter too much to have a decent experience and not everyone can or will update their phone every 1-2 years. I have had this phone for 2 years now and I know for a fact now the only reason my phone has memory problems is because of the Google Services App and how many processes it runs. Can you imagine how many people have a 1GB of RAM devices or lower? And they have to put up as much or worse performance than I can encounter. That is unacceptable. FYI: KitKat was written for 512MB of RAM devices. Google Services though was not. Well... its a give/take... As the saying goes, there's no such thing as a free lunch. Now, could Google perhaps make the individual services inside their framework more a la carte? Perhaps, but I suspect that doing so would be a nightmare to make stable. As is, there are means by which you can reduce the load. But oftentimes, progress comes at cost.... and with the speed of mobile tech, that cost might be a perfectly functional phone that no longer has enough horsepower. My Nexus 5 was fast and fluid with KitKat. Once it updated to Lollipop, it's been a lagfest. It seems the developers turned a complete 180 - KitKat was all about buttery smoothness. Lollipop is all about laggy animations. That's horse radish. This is a failing on Google's part. Moto G owners on Reddit have had memory issues too. It seems it is happening with all 1 gig of ram devices. They can definitely trim it, but they won't more than likely. A 2 year old phone with 1gb ram and qHD is a lower end device,which is part of your problem. Both my Verizon Samsung Galaxy s3 and Verizon Samsung Galaxy Note II had 2gb ram and HD screens,and the s3 is now 3 years old. Recently, I bought a lg g2 new unlocked for $190 on sale, no contract. I have seen the Verizon moto x 2013 developer edition 32gb for around $200 no contract as well. A 2-year old low-mid range phone will not be the best user experience. You can get much better phones for a reasonable price. I have been slwoly thinking on getting an iPhone 6S if it has 2GB of RAM. I want a phone that will be supported with updates for the length of my smartphone contract and I want a phone that is not slowed down because of Googles inability to streamline Android. Time will tell, I won't get a new phone until December, so I have time. But the Google Services/Settings App RAM usage is getting on my last nerve. Comparing an older Android phone that wasn't a flagship to iPhone doesn't make sense. You have to compare flagship to flagship. All the new phones (my Note 3, Note 4, S6) all ran (or run in this case of my Note 4 and S6) fine. The iPhone may get updates but that's about it. It still has its issues with it being a closed OS and certain tasks being harder than they should. Sadly there is no perfect OS or phone. And yes I've used iPhone. I have an iPhone 6+ as well. First they optimize Android by adding Project Butter in JellyBean and optimizing even further in kitkat by making it run smooth on 512mb Ram devices. And then they undo all of that in Lollipoop.
" Android, or to be precise Java, uses a garbage collection solution for memory management.To be efficient, GC needs a lot of headroom. Dependingon the type of GC, you really need 2X to 8X more memory than you are actually using to get good performance. When memory is constrained the system slows down dramatically.iOS does not use the same solution and does not incur this penalty." "Android, or to be precise Java, uses a garbage collection solution for memory management.To be efficient, GC needs a lot of headroom. Dependingon the type of GC, you really need 2X to 8X more memory than you are actually using to get good performance. When memory is constrained the system slows down dramatically.iOS does not use the same solution and does not incur this penalty." That is complete nonsense. An Android device with 1gb of RAM can run fine, and the Android system alone uses half of that. I'll readily agree that Android is poorly optimized compared to iOS due to the number of devices it has to support, but whoever says you need half your RAM free to have a smooth experience, let alone seven eighths, is making stuff up. More RAM usage more apps GE dumped from memory leading to more app reloads and your phone running poorly because it can't get enough resources to run well. That isn't the issue, and what I highlighted before. My phone runs fine, that isn't the issue. My issue is that Google Services is a RAM hog using too much RAM. Less RAM I have, the more apps relaod and run janky. This is all because of Google Services, because I have run my phone without Google Services (I disabled it) and there was a noticeable increase in performance. Being a closed OS isn't a con anymore. Android has become closed down too, you can't even use background syn natively without Google Services installed and enabled. Google made Android Dependant on Google Services so they definitely closed it down more. And certain tasks run and are easier on iOS than Android. I love the utility of Android, but update support has and continues to be, shoddy as hell. And again, my phone isn't the problem, Google Services running like 15 different processes in the background on my phone is the problem. I should've expected people would try to immediately blame my phone, when that isn't the issue at all. Point being, if your phone had 2gb ram, then this wouldn't be an issue. Yeah you can disable Google play services but you are missing out on a lot. My s3,despite being 3 years old, has no memory problems. And both the s3 and droid razr m use the same qualcomm snapdragon s4. Then that's a problem if I need 2GB of RAM to not have an issue. Not every Android device has 2GB. And that is the issue I was highlighting with my post. At least (possible) half of all Android devices don't have 2GB. What makes it ok for Google to do this without it ever being addressed at all? I have read countless stories and issues from being having memory issues from Google Services running too many processes. We should be able to pick which processes can run at least. Google Analytics and Android Wear don't need to use 100MB+ of the RAM I have left. I would have to disagree. On my iPhone 6+ I had to specifically open the app and let it stay in the front to work. Such as backing up photos to Google + .. I had to open the app and let it sit. If I backed out of the app? The upload paused. If I wanted to download a GPM playlist while I slept so I had it in the car for a trip .. It had to stay the front app. Get a text and go to respond and don't back to GPM? It stops the download. And you say it isn't a con anymore .. to .. You? Or just everyone? Because I disagree with it not being a con. I am not saying it is a 100% bad thing but . .there are definitely some issues with it. Also Google Play Services being installed sounds normal .. I bet if you could remove services running in the background from Apple (like I bet there is an iCloud service and such) it would stop working. It is just Apple doesn't let you see these things .. Android does ... So I wouldn't just think they aren't there because you can't see them. Google+ on iOS doesn't back up photos automatically in the background because Google has chosen not to use that feature. OneDrive on iOS backs up my photos automatically in the background very nicely. Those are your specific use cases for multitasking. 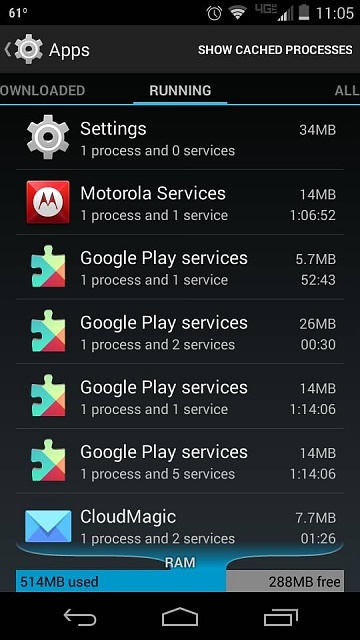 My issue is that Google Services is running way too many processes on my phone. I shouldn't have to suffer performance issues because Google can't trim the fat. Is it possible for me to put color back into my phone? Hey, what kind of phone is that? Why are my photos stuck in the cloud after activating a replacement phone? New Lollipop on Tab S 10.5 Why is my pull down notification shade so small?